Lately I've been seeing them on home decor items such as pillows and candles, on jewelry, and on women's apparel. So basically skulls are really in trend right now! So much so that we even have them in my MadeByGirl shop with items like the popular double skull bracelet & even the skull patterned poster. So, if you'd like to jump on this trend, here are 15 of my favorite skull items out there! What do you think of the skull trend? Are into it? A mcqueen clutch is a MUST! I do love this edgy touch in decor! 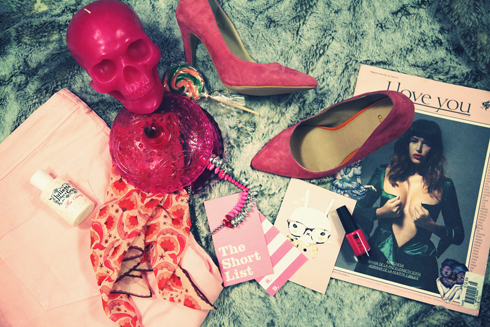 It's fun to see a glam girly room rocking a skull head, don't you think? Love it! I've been noticing this trend too! I love the edginess of it, perfect for more girly pairings! Some gorgeous options here! I love the DL&Company candle with the gold skull! They have the best 'candle cases' out there! I just bought one of the skull bracelets from your shop (literally, just pressed the pay now button a minute ago), and am giddy with anticipation over its arrival. Love the Skull Pattern poster! Gives a room that instant edge! I really like the skull trend. I bought a bracelet from baublebar and saw yours yesterday. I really like it a lot...and mayb have to add it to a "to buy" list soon. I need that mcqueen scarf!!! I love the union jack clutch? Is that what its called a clutch? Not very fashion forward I guess. Herend skull decor? hilarious. I think of them as so stuffy, elite, elegant! but this is great. Love that clutch!!! Love this post, was on my list to do a post on skulls as well!! I'm so into it that my younger son's birthday will be a Pirate Theme - skull and all! I'll be buying your skull bracelet soon. It's rockin' cool! just purchased the bracelet! i've been hoping to get the mcqueen- but this is just as fab..can't wait for its arrival!